The 2016 Australian Security Industry Awards for Excellence are Australia’s premier security awards program. This year’s Security Industry Awards were held in conjunction with the Outstanding Security Performance Awards (OSPA’s) they are part of a global initiative providing an opportunity to recognise companies and individuals across the security sector who have demonstrated exceptional achievements. The 2016 Awards Ceremony was held at the Westin Hotel, Sydney October 20th 2016. 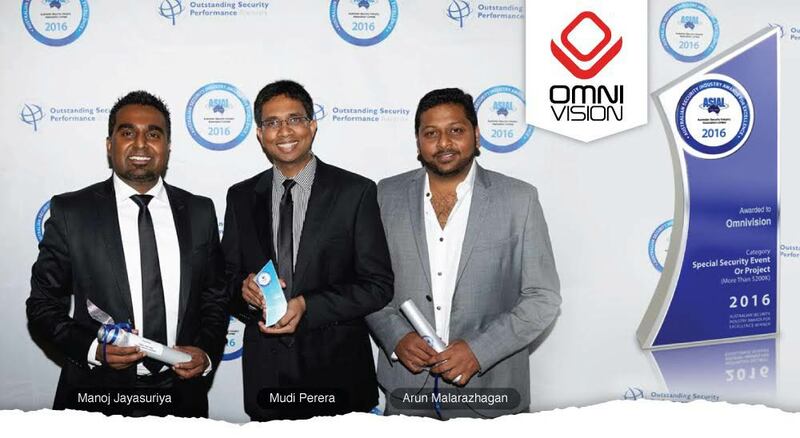 Three key people who represented OmniVision, Manoj Jayasuriya, Managing Director, Mudi Perera, Technical Director and Arun Malarazhagan, Project Manager. We were truly honoured by the attendance and support of Sean Harran, Security Manager – StarTrack for the awards night representing our client. OmniVision was nominated for 2 awards for projects completed for Australia Post and StarTrack. OmniVision provided a fully integrated security system to Australia Post & StarTrack. The solution provides 100% coverage of the parcels area within the sites comprising of CCTV cameras capable of vehicle and driver identification. OmniVision was announced as a finalist in the category Special Security Project (over $200,000). We were proud to be announced as the WINNER. This award was the most applied for award of the night. We were recognized for the innovation, integration and engineering combined into a single solution. We were a runner up of the second award, Integrated Security Solution (projects over $200,000). The team at OmniVision is very proud of its achievements on this night of nights for the security industry. We remember the complexities and challenges we had overcome, we recognised the commitment, hard work of each and every team member and finally the excellent support provided to us by our solution partners Guetebruck, Axis and Innerrange. We look forward to providing you with innovative, smart and cost effective security solutions that will make us all winners. Contact OmniVision on 1300 688 788 for your next security project.